Your eyes are the window to your overall health. 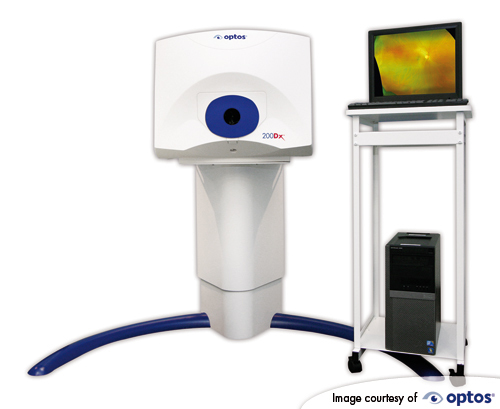 We offer the OPTOMAP which is an ultra-wide digital retinal imaging system. It can capture up to 80% of your retina with a panoramic image. This aids in the earliest detection, treatment, and management of diseases that can affect both your eyes and your overall health. Adding this latest technology to your eye care will help you and your eye doctor make educated decisions about your well-being. The retina is a thin layer of tissue that lines the back of the eye on the inside. It is located near the optic nerve. The purpose of the retina is to receive light that a lens (much like a lens inside a camera) , has focused, and convert the light into a message that is sent to the brain. This message will then be interpreted as a visual image or object. What are some of the eye or overall health conditions that may be detected with the Optomap? Diabetic Retinopathy is a complication from uncontrolled Diabetes. Uncontrolled Diabetes can damage tiny blood vessels within the retina and is one of the leading causes of blindness. Early stages of this condition may not be apparent to someone with this condition and may threaten to damage your eyesight. Utilizing the Optomap imaging system and capturing a real-time photograph of this is critical for the eye doctor to manage it’s treatment and management. In addition, it will create a visual tool for the patient to see exactly what their eye doctor sees, and enrich their own understanding and urgency to control the condition. Age-related Macular Degeneration is the leading cause of profound vision loss in people over age 60. It occurs when a small “bull’s-eye” in the retina, known as the macula, deteriorates. Because the disease develops as a person ages, it is referred to as age-related macular degeneration (AMD). A retinal detachment is when the retina separates from the back of the eye. Symptoms may be sudden flashes of light, intense floaters, and blind spots in the vision or total loss of vision. A dilated examination, with the addition of a photographic image such as the Optos, will reveal an accurate portrayal of the immediate and urgent referral to a retinal specialist for it’s repair and management. What may some of the symptoms of Dry Eye Syndrome feel like? Online patient forms that can be completed in your home or office. Take a look at our extensive line of brand-name eyeware. We are Mooresville, North Carolina's hometown family eye care practice.